Colourful Notions by Mohit Goyal is the debut book of the author and a book quite unlike any that I have read in my journey as a reader. This book decribes itself as a travelogue but is so much more. There is friendship, emotional play and some real drama included along with extensive descriptions of places across India right from east to west and north to south. I loved the three characters Sasha, Unnati and Ab. They are truly musketeers and following them around in their adventures on this road trip across India was fun and so entertaining. Sasha is a friend everyone will recognize easily. We all have one such friend who is goofy and a fun friend. Mohit Goyal through his fluid narrative sucked me in and held me captive right till the end. I saw India in a new light and while some places were known to me but still the crazy funny escapades had me thrilled, there were others I visited for the first time and absolutely loved the experience. A must read for everyone, I give Colourful Notions by Mohit Goyal 4 stars out of 5. 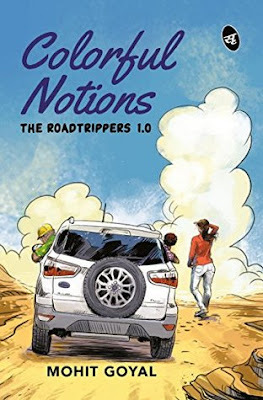 This is a noteworthy debut and a book that not only entertains but also will make you want to go road tripping yourself. I received the book from the author and as part of Writers Melon Review Program and I am very thankful to them. The above is my honest and unbiased review.